One of the most frequent questions we get from our clients is, “What else can I do to increase my e-commerce sales?” While we support a long term marketing strategy to improve revenue for e-commerce businesses, there are things that you could do to push sales for your site in the short term. Here are some very effective strategies. Getting listed on Google Products is a must for every e-commerce site. It might seem like a difficult process but it’s actually very easy. Most likely, you can export a data feed of your products from your e-commerce system, do some edits and upload to Google Shopping via AdWords. You must have an MPN (Manufacturer’s Part Number) or a UPC (Universal Product Code) for your products. With Google Shopping, you pay for every click. However, it’s great because this is the only product advertisement where your e-commerce items can be on the first page of Google search results with a photo and price. Also, Google’s conversion rates can be very high. There are a few good shopping comparison sites. 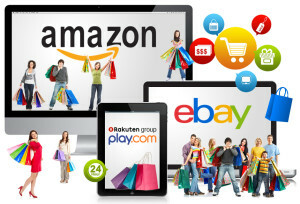 These are very similar to Google shopping and require that you upload your product feeds in a specific format. The best ones out there are Shopping.Com and Pricegrabber.Com. If you are looking to increase revenue in the short term, shopping comparison sites will give you that boost in traffic. The conversion rates on these sites differ. We would suggest that you list items with high value and high margins. The CPC (cost per click) charges will be at least $3.00 per click so do not list any items that sell for less than $25 – $30. You just will not make money there. Filter items that have higher prices and margins. You could literally double your business in 10 days if you have the right kind of products and competition on Amazon. We have had clients who went from zero to $60,000 sales on Amazon in just 1 month! Sign up for an Amazon account and register for the Professional Selling Plan . It costs $40 per month. You can choose to add your products in the Amazon Seller Account one by one or upload in bulk. Uploading your items in bulk requires some technical knowledge. However, you can read all about it here.Of course, contact us if you require assistance. If you have less than 50 items, you are good. But if you have more than 50 items and possibly hundreds, you want to setup an Appeagle account. This will allow you to compete with other sellers automatically. This is a bit technical as well, but it will make you money! It allows you to automate your pricing and your listings so that you show up higher on Amazon searches. Once you start doing orders in volume, you will need some sort of shipping integration to ship a high volume of orders each day. Shipworks is a great tool for that. We all know EBay. While EBay has been less popular in the past few years, it still holds serious potential. If you have decent margins and niche products, you can make money on EBay. Just remember that it’s a lot of work and maintenance. I would suggest testing a seller account and creating an EBay store. Rakuten has good potential. There’s still not much competition and Rakuten has great traffic stats. The products for sale are few and the potential to generate orders is high. Sign up for an account and list your top 50 items on there to test. We have had success with some clients. If you have niche products, Google AdWords’ CPC model can be effective. If you are not yet advertising with Google, I would suggest taking your top 10 products with higher margins and creating a campaign to target their keywords. You might be amazed with the results. This works especially well if you ship internationally and you have high search volume and hot products. (Brand name watches, clothing, cool electronics, etc.) International CPC rates are very low for Google – about 10 times lower than the US. Retargeting can be a powerful short-term strategy if you are already spending money to bring traffic to your site. A small pixel is dropped on your customer’s computer when they visit your site so that you can display ads later when they visit partner websites. Google and AdRoll are the top players who offer a wide network of advertisers. Retargeting can be powerful, especially if you have products that require a longer sales cycle. This way, even when the user comes to your site and leaves your site without making a purchase, you can still display ads to them until they make a decision. This can be a real moneymaker if executed correctly. Facebook ads can be very effective when marketing a gadget or an interesting item. However, the CPC rates in the US are very high at about $2-$5 per click. But, if you ship internationally, the CPC rates can be as low as $0.05 per click. This means that you could get an extra 1,000 visitors to your product pages for a mere $50. We have tested this strategy with some clients and made thousands in just a few short days. The trick here is to “Try NOT to Sell!” That’s right. If you try to sell on Facebook, it will not work. You have to be smart and witty, and make it look cool. Contact us and let us show you how we can help you with that. This medium is now saturated and considered spam. However, there is still some opportunity. It really depends on your business model, product line and how good your supply chain is. In affiliate marketing, other webmasters and bloggers promote your products and send traffic to your website. If the traffic they send converts, they can earn a percentage of the sale amount. This commission can change depending on the type of product and offer. If executed correctly, affiliate marketing can be a serious source of income. The 2 largest affiliate networks are Commission Junction and LinkShare. They cost about $5,000 to set up but have the most reliable affiliates. ShareASale is another network that costs about $600 to set up. Remember, you must have high margins and great offers to attract good affiliates. Most of us get these deals in our inbox. If you have a specific attractive product or service, and you can make a great offer like 40% off, this is worth a shot. Groupon or Google will take a big chunk of this, but you could hit some volume in the short run. We have tested this with some clients. A word of caution: it does not work for everyone. But when it does, it’s very profitable. Drop Shipping is a complex strategy but it works like a charm. The idea revolves around having 5-100 resellers advertise and sell your products. Your resellers would not need to keep inventory or rent an additional warehouse. They sell your products and you ship it for them. This is called drop shipping. I know that some of you might have heard about this and it might not sound so attractive. However, consider that one of our clients recently executed this strategy and increased revenue by 30% in just 30 days. It’s not easy to execute. There are a lot of integrations and coding as well as planning that is necessary. But it does work! I’ll show you exactly how in my next article, where I’ll explain this strategy in more detail. We hope that some of these suggestions will help you. Of course, if you need a more advanced and professional consultation, contact us.